Of the suggested subjects, I picked “the raw materials of food”. This was based on the (possibly wrong, but more about that in the conclusion) assumption that being able to control the compositions completely in a studio environment would make it easier to get some great shots. I started by brainstorming to come up with a list of candidate shots. While some of pictures were easy to come up with ideas for (curves), others took a lot more effort (single point). I found that while I started by thinking about composition of pictures, in order to demonstrate the different design elements, I quickly began to think of food materials showing having the required shape/form. 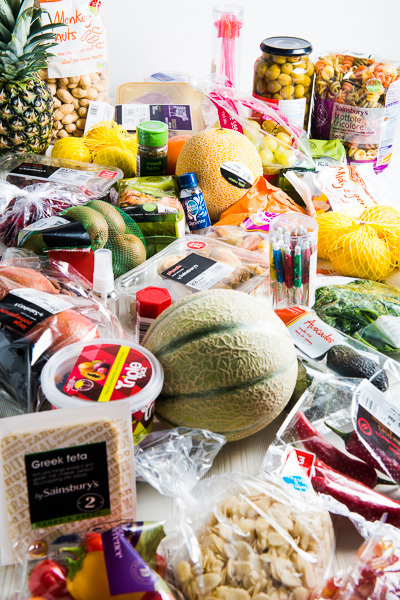 For instance, instead of diagonal compositions, I began to list food stuff with diagonal lines – pyramid-shaped tea bags, triangular shaped frozen veg, and so on. This caused me to reject several ideas and start over a couple of times, and at times I found it almost impossible to get the creative juices flowing. Eventually I decided that I was probably over-thinking things, and forced myself to go with what was already on the list. I set aside a weekend to do the actual shooting. Got up early Saturday, made a shopping list and visited the local supermarket. While browsing, I let myself be tempted by shapes and textures, and ended up buying plenty of things which weren’t on the list. This was fortunate as it happened, as several of my preconceived ideas didn’t work very well as photographs. So at least I had spare props. After unloading my 5 shopping bags of food materials, I finally turned the living room into a photo studio and got rid of everything on the kitchen counters so I had space to prep each picture. By now I had used up my burst of energy, and although I was looking forward to getting on with the assignment, it was already afternoon and I began to dream about flopping in front of the telly. I ended up doing 4 pictures on Saturday, of which I discarded one as soon as I saw the results on the computer monitor. Sunday, however, with the ingredients already bought and the studio already set up was far more productive. In maths a point has no length, width or height. In the real world we can’t photograph points, but must instead photograph objects which have a shape. On my prepped shoot-list, I had written “steak on chopping board / stock cube / cherry, plenty of negative space to make it a point rather than a shape”. So I plopped a cherry on a dish and took a picture. It looked like a cherry plopped on a dish. Not a very interesting picture. I tried to make the picture funny by placing a knife and fork, as if the viewer was invited to sit down and have a party. With a cherry plopped on a dish. This was definitely an improvement, but the pun with the near-empty plate still didn’t look right. 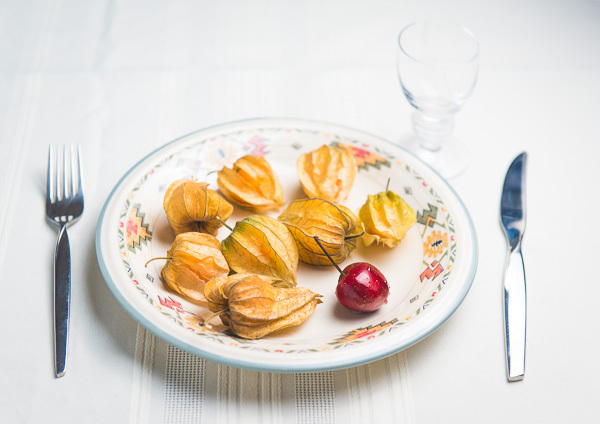 In the end I filled the plate with physalis and a single cherry, and added a small glass as well. The plate, table cloth and the leaves of the physalis are all soft, muted colours, which makes the bright red cherry stand out as the focal point. I emphasized that with soft lighting and by choosing a wide aperture so most of the props fade gently. While taking the picture, I realised that the perspective turned the knife and fork into converging lines. To avoid that I angled them slightly outward, so that they ended up being parallel to the edges of the picture. 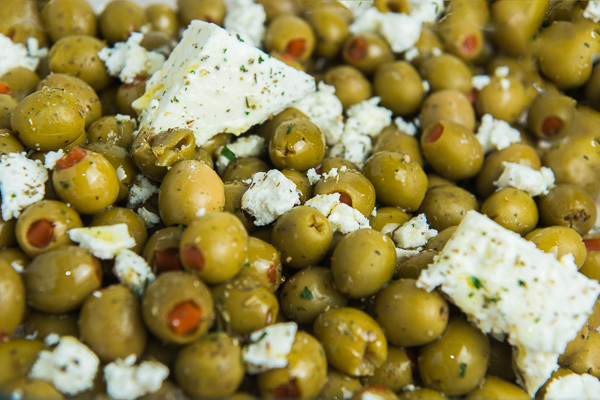 My initial idea was a bowl of olive & feta salad, with two large blocks of feta as the two focal points. However, the picture wasn’t quite as strong as I had imagined, so I decided to use it for the “distinct, even if irregular, shapes” instead. This was one of the situations where Sainsbury’s tempting fruit & veg department came through for me, as I had picked up cranberries and a pack of avocados on the off chance that they could be useful. 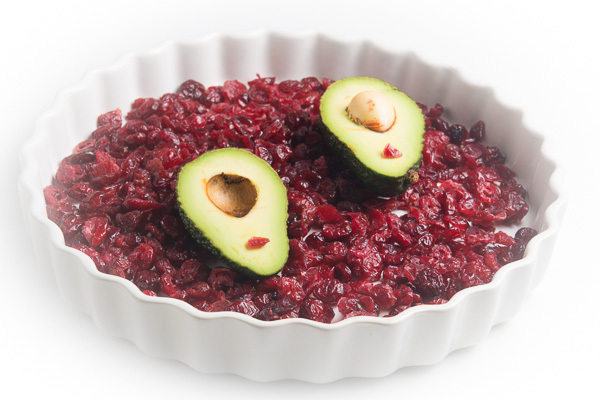 The cranberries give a nice colour contrast to emphasize the green of the avocado, and the diagonal placement of the avocados was chosen to make the picture more dynamic. I added a white vignette in post processing to make the pie dish blend in with the background. 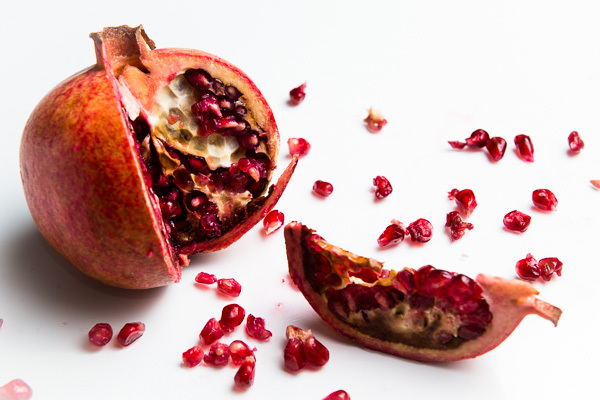 I had decided during my brain storming to take a picture of a slice of fruit, to show the beautiful way nature often arranges the seeds in a fruit. My first idea was a tomato, but the beef tomato I had bought didn’t look particularly impressive inside. 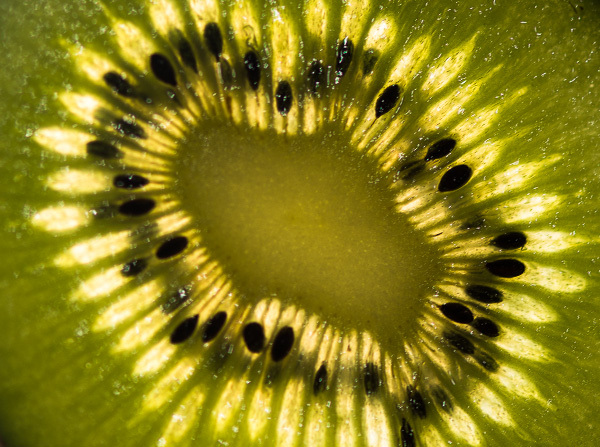 Instead I ended up using a slice of kiwi with the seed pods radiating out from the oval centre of the fruit. This was one of the pictures where I had the debate with myself mentioned earlier about composition / food stuff that happened to show the desired effect. In order to back-light the fruit, I placed a flash in the kitchen sink, put a sheet of glass over the sink, and then stood on a chair leaning over the glass sheet. In my nativity I thought I was able to hold the camera parallel with the glass, but it’s clear from picture that the camera was angled. This unfortunately resulted in not all of the fruit being in focus. This was my first picture on Sunday morning. During the preparation I had written “grapes arranged in a grid to imply the lines” on my shoot list, so I started by laying out a grid. That in itself didn’t look like interesting, so I toyed with the idea of getting the chess pieces down from the loft and turn the grid into a chess board. From there I decided to use my fruit and veg for the pieces, and because of that I changed it to draughts rather than chess. Simpler pieces. The two kinds of fruits I had of similar sizes were grapes and cherries, but if I used the grapes for pieces, I couldn’t also use them for the implied grid. 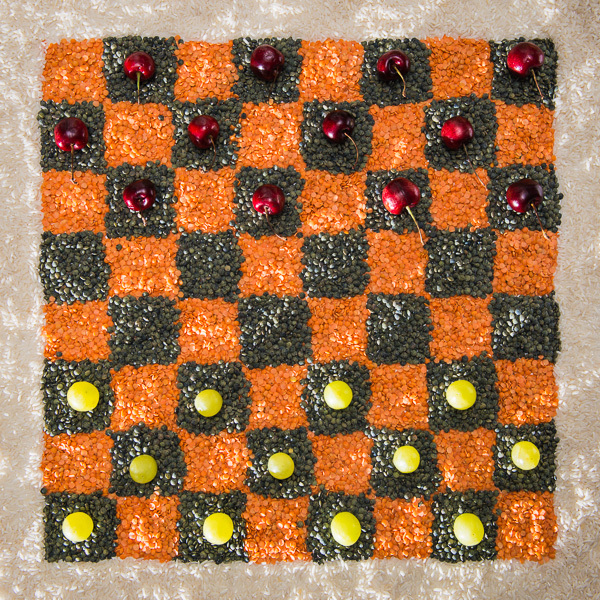 I ended up deciding to go to town with textures, and make my own draughts board with orange and green lentils to colour the squares. Creating the board was time consuming and fiddly, but straight forward. I marked the squares on a piece of foam board and then just poured a handful of lentils onto each and arranged them with as straight lines as I could. Having learnt the lesson from Saturday’s kiwi picture, I knew that I had to get the tripod out to stand a chance of getting the camera plane parallel with the board. Also, with the straight lines of the board, any tilt vertically or horizontally would immediately be visible as converging lines, rather than parallel ones. To give myself a chance, I included a bit of background on all four sides of the board, so that if my set-up wasn’t 100% accurate, I could try to fix it with Photoshop’s free form transform. The orange, bottom-right “square” is oblong rather than square; this shows that it ended up being necessary to tweak the picture in Photoshop to get the lines to be parallel with the picture edges. I wanted to emphasize the texture of the lentils with hard light, so I placed a bare flash as key only slightly higher than the board so the light could rake across the lentils and create highlights and shadows. At first there was quite a fall-off of light across the board, but by moving the flash further away that disappeared (the inverse square law to the rescue!) Once I had a sufficiently dramatic light on the lentils, I bounced another flash off the ceiling to provide fill. Finally I added the grapes and cherries, only to realise that my fill light was too dim and that the cherries looked more black than red. So I had to increase the fill and reduce the key, which also reduced the contrast of the picture. Comparing it against the before-image I now think that was a good thing. Although it’s not at all same the picture I had imagined during my preparations, I am pleased with the outcome and feel that the creative process of getting to the final result worked well. My shoot list suggested pyramid shaped tea bags, Birds Eye frozen veggie pyramids, or a drink with a leaning diagonal straw. I hadn’t been able to find any pyramids at Sainsbury’s, nor any straws, so my last shot Saturday was of a V-shaped Martini glass. I wasn’t very pleased with the picture, and when I got it on the computer screen, I decided that I had to re-think the idea. I went over several ideas, and for a while I was photographing sliced chillies arranged diagonally across the chopping board. However, all of them felt contrived. 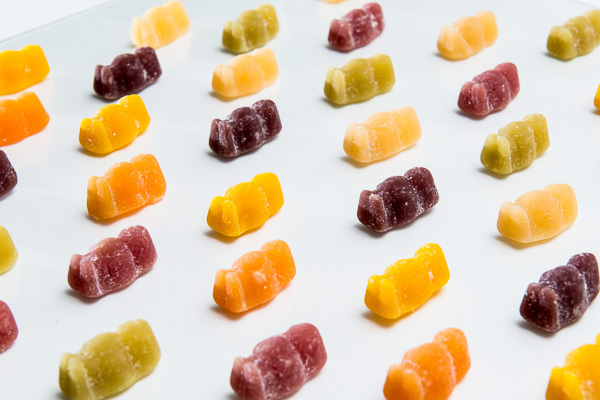 The very last image I made, after having arranged my jelly babies for an implied-triangle picture, was of jelly babies arranged in diagonal lines. I chose this picture for its bold and simple lines. 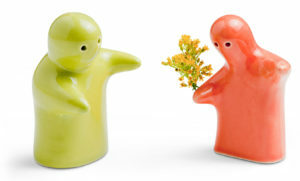 The shape of the jelly babies creates a diagonal from lower left to upper right, while the colours of the jellies create one from lower right to upper left. Curves are plentiful in the fruit and veg department, and I had noted “pepper fruit, pears, fish, melon, rim light to emphasize shape” on my shoot list. So I brought a Cantaloupe and a Galia melon home. 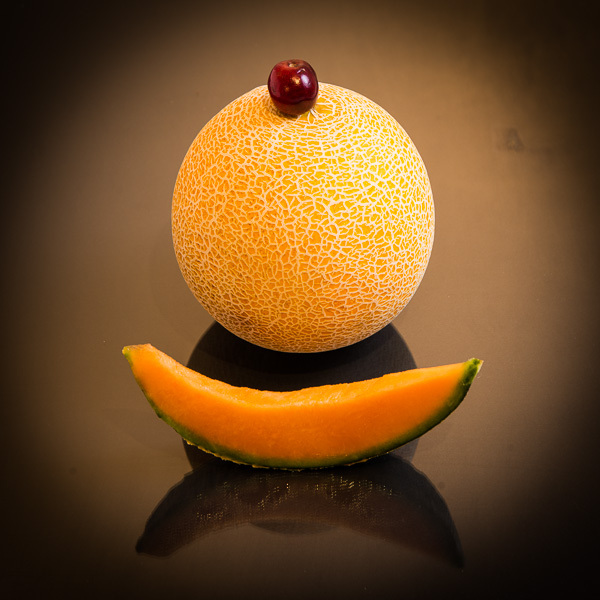 My first attempt was a picture with multiple slices of melon on the chopping board, but the more I worked with the setup, the messier the picture became. So eventually I gave up on that approach and instead came up with the picture of the slice of melon in front of another melon. Seeing the picture now a few days later I’m not convinced that the cherry on top was absolutely necessary. This had me scratching my head over the same old confusion of mine – is it about the composition or the subject. I can’t see “distinct irregular shapes” as being a useful compositional guideline, so it had to be the subject matter. On my shoot list I had noted “paste shapes / jelly babies”. So I set out the jelly babies, and ended up taking the shot mentioned under “diagonals”. But fortunately I also had my “olive and feta” picture that I had decided didn’t cut the mustard for “two points”. So I have decided it makes a good candidate for the distinct, irregular shapes. 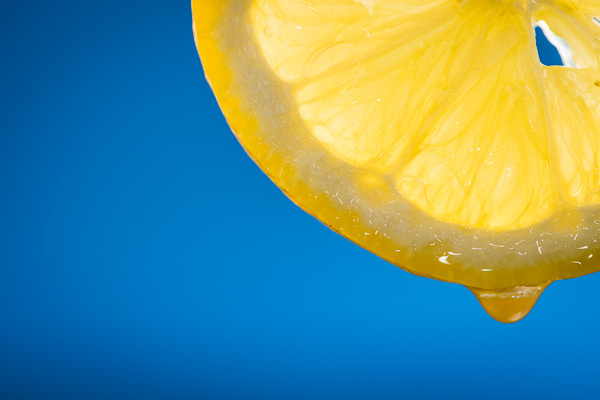 I had decided early on that one of the implied triangles should be a slice of juicy lemon in the corner of the frame, but it wasn’t until I was setting the shoot up that I got the idea of gelling a flash with blue and aiming it at the background for contrast. The triangular hole in the upper right corner of the lemon is where one of the seeds were – I had noticed during some of the test shots that seeds came out looking like murky dark shadows, so I removed them from my slice. The hole in the lemon as a result was accidental, but seeing it now I think it was a good accident. Its shape mirrors the blue background, and it gives a visual balance to the image. To get some drops to make the lemon look fresher, I sprayed it with a glycerine/water mixture. I might have been too generous, as it was slowly dripping off the slice, so I made a point out of waiting until a drop was ready to fall and then took the picture. For my next triangle I had cut a slice from a pomegranate so it would look similar to a pie chart. I included the slice in the picture as it also looks triangular from this angle, and filled some of the empty space with juicy bits of the fruit. I made a third implied-triangle shot with my jelly beans arranged so the different colours formed triangles within triangles. To break the pattern up and introduce more visual interest, I removed one of the green jellies. For the exercise I have decided to go with the pomegranate instead of more jelly babies. Firstly because there is already one jelly baby shot in the set, but also because I really like the lush, tempting colours of the bigger fruit. During my brain storming, I had planned on creating an intricate layout of muesli ingredients, but with the earlier manufactured shot of the draughts-board, that felt too much like repetition. 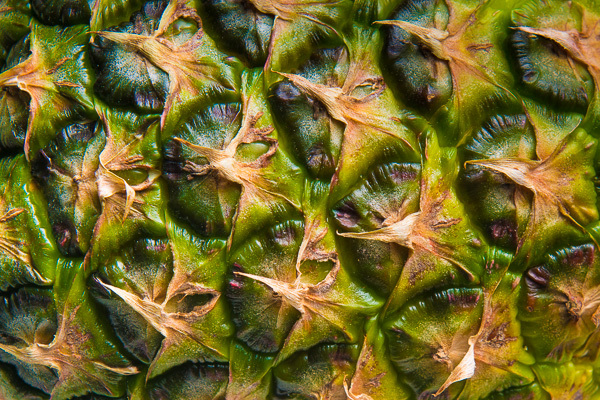 The pineapple I had bought for its wonderfully textured skin, however, looked like it would work just fine. The texture has enough variation to feel like a musical rhythm. Seeing that the picture is abstract, I cranked the vibration up to full in Lightroom and also sharpened it quite a lot. It’s meant to be about colour, texture and rhythm, rather than a 100% accurate rendering of a pineapple. 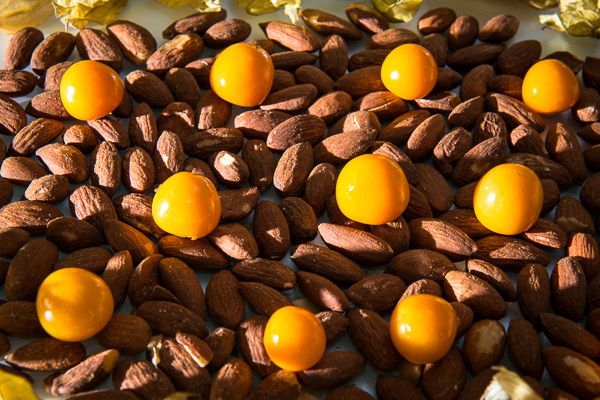 Fortunately I still had a bag of nuts and the physalis I had used for the “single point” shot on Saturday. So I arranged them in a regular pattern and lit them with soft overhead light and a hard light raking across the nuts to show off their texture. The yellow and brown colours make a nice harmony, while the size differences and the completely different textures add contrast and visual interest. It has been an interesting exercise in following a brief, and I am surprised by the number of times where I changed my mind about the pictures. Normally when I do still life setups I end up with slight variations on the original idea, rather than completely re-thinking the idea, but on the other hand, when I do still lives, I normally do one rather than ten right after each other. It has certainly taught me the need to think the compositions through in more detail during the preparation phase in order to not have to spend forever re-doing things in front of the camera. Having said that, I am pleased with the pictures and feel that the creative problem solving process worked well when I had to improvise in order to set up something “picture-worthy”. I initially picked the subject raw materials of food because I thought it would make the job easier to have full control in a studio environment, but I am not at all convinced that’s the case anymore. With street details or landscapes, for instance, it might have been easier to focus on the composition without worrying about the shapes of individual objects. Or maybe I would then have written a conclusion in which I wished for a studio based approach to at least have some control. The jury is still out on that one. On a practical level, I have also learnt (again!) that creativity requires mental energy. Spending my most energetic part of the Saturday buying props, carrying lights, stands and backgrounds etc., as well as tidying up the kitchen was a silly mistake which made making some of the pictures harder than it otherwise would have been. Next time I will make sure to do more of the preparations in advance! The final collection of images will be useful for me as a “reference library” of compositional effects, and I hope some of them will become second nature rather than theoretical constructions. I can see myself trying to simplify my compositions and arrange things, for instance, in triangles to hold the picture together, and I would like get more used to recognise the visual impact of rhythms and patterns when I’m out taking pictures. But I can’t see myself stopping a shoot to wonder “is this a rhythm or a pattern” or thinking “oh look, those sheep have very distinct sheep-like shapes”. Conversely, having a vocabulary to describe these distinct effects is very useful when analysing pictures, so the “reference library” will be useful in that respect. Feedback on the assignment from my tutor is here.